In 2009, when my Grouse Grind® time was close to 54 minutes many people around me thought that I would have trouble achieving a sub 40. On September 10th, 2009 my new personal best was 39:58. Although, I have over 20 years experience competing in endurance sports, I had not entered a biathlon or cross country skiing race in several years. 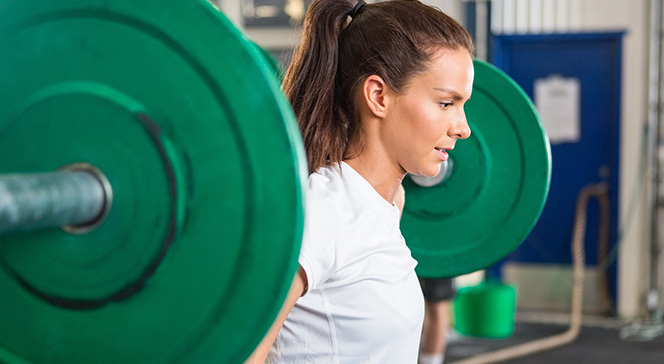 Have you thought about adding strength training to your weekly routine? This is what I did in 2009 to take 15 min off my time without being on the trail six times per week. Today I started to strength train again as I strive for a 32 minute time for the BMO Grouse Mountain Run in late September (as of July 1st my PB is 37:13). Many people due to scheduling conflicts can only climb once or twice a week. So, what are you doing on the other five to six days per week? Add two additional cardiovascular training sessions and two strength training days. As Dan John and Pavel Tsatsouline describe in Easy Strength: How to Get a Lot Stronger and Dominate in Your Sport , the strength days are to support your sport days, not end up making you so fatigued you don’t have anything left to put out for your sport, the Grouse Grind®. Getting stronger will improve other aspects of your health while making the rest of life’s movements a little easier. Lifting form is VERY important to groove proper movement patterns and prevent injury both long and short term. If you don’t know how to do them, contact a Certified Strength and Conditioning Specialist (NSCA-CSCS) in your area or if you come to North Vancouver I would be happy to put together a program for you. Here are some basic exercises to get you started. There are several ways to regress or progress them. Progress from having your knees on the ground to your legs straight. Tighten up your thighs and buttocks to take the stress of your lower back and activate the lower fibres of the obliques more. Make sure that you’re bracing your abdominals (think of a big wide belt). You should feel zero lower back pain. The diaphragm, a deep core muscle attached to the ribs and hip flexors is important for breathing, but also for stabilization and power transfer to the limbs. Make sure to breath into the abdominal wall without softening the out layers of the core. When the diaphragm fatigues, you get less power to your legs.Your weak spot is where you fatigue first. Being able to do the plank well enables you to complete proper push-ups. Too many people I come across can’t do a push-up with their legs straight. Keep your hands aligned with your shoulders. Yes, I push and pull myself up and over the top of the last rocks before the clearing using my upper-body, much like a rock climber. (Alternative is a Dumbbell Chest Press). This is a great one for that posterior chain, that Kinesiologists and Strength Coaches love to train. When properly progressed almost anyone can do this without injury. You’ll not only look great but you will have a better hip drive during each step. Keep in mind this exercise is for the HIPS, but due to all the stabilization it activates the erectors down your spine isometrically as well as the lats to keep the bar close to your thighs. ​As you lift keep the weight close your thighs and push your hips forward (glutes, buttocks) to drive back up to a standing posture. Your spine needs to stay stiff and long as your pelvis hinges around your thighs. Shorten the range of motion and lighten the load when first learning this exercise, e.g. don't go all the way to the ground. A strong back is part of creating a good arm drive. Too many people place their hands on their knees or hold their elbows on their hips. Doing either of these means a lose of power that can be generated from the torso to the hips. Use a variety of different grips. Some gyms will have assisted pull-up machines that so that you can progress to using your full-body weight. Ah, I love and hate these squats with the weight in front. These are awesome at developing stronger thighs to help you climb and push up those stairs. Keep the core braced. Have trouble lifting overhead? You need to do more pressing movements. Be careful of loading this one too quickly if you have had previous neck injuries. If you wake up with a stiff neck the next day – it it is often the upper traps that are tight. This means you either lifted too much or not correctly. Keep the weight slightly in front of your of your ears. Lay on your stomach on bench with the weights on the floor. Pull your shoulder blades together; as you do this slide your shoulder blades down towards your back. As I stated before – and this is from years of experience which was reconfirmed in Easy Strength don’t smoke yourself in the gym. Less is more. Feel refreshed and invigorated after each session. This article is not to lay out a detailed plan, but instead to get you thinking about strength training if you aren’t already. Once you have had sufficient accumulation then add greater intensity (e.g. load). A traditional way of measuring cardiovascular intensity is the rating of perceived exertion (RPE); this can be applied to weight training too. For example today I dead lifted my body weight using the 2, 3, 4 method as above; my RPE for these three sets was 5, 7, 9 out of 10. In the coming weeks I can track these; as I gain strength the RPE should go down, which means I can then add more weight by 5-10% (you are asking for an injury if you do more). Don’t get fooled by the latest and greatest fitness trends because lifting iron is a great way to add a lot of zip to your step. If you don’t like dumbbells and barbells try Kettlebells with instruction by a Russian Kettlebell Coach (RKC). Again, if you are unfamiliar with these exercises seek the help of a qualified strength coach. An excellent coach will correct your form to ensure you are doing the lifts safely and effectively, progress you at an appropriate pace and encourage you to challenge your limits. If you're interested in participating in making your Grinds count for BC Children's Hospital through Grind for Kids. Contact me at 604.283.1858 or alfred@lifemoves.ca to book a series of training sessions.